own programs to work with the OS and/or work between each other. Ok, so Blu-ray is not new…. And a variety of programs can now create Blu-ray media…. I know, I know…. I discovered this when I recently had to work myself through the process of shooting at 24p on a Canon HV-20 with the idea of outputting it in 24p using a PlayStation 3. It got complicated on my Apple system. I first had to used Apple’s Compressor to transcode the 24p frames out of the HDV bitsetream, edit it using in Final Cut Pro, run it through Compressor again to create an H.264 stream and and finally write the 24p h.264 stream back to Blu-ray. Yuck! I found it was much easier using Pinnacle’s Studio 12 (which saw the 24 p stream immediately) and after editing my material it appeared to write it back to Blu-ray as a 24 frame file. Well at least that’s what the Playstation 3 told me. With that bevy of experience behind me a research project crossed my desk this month that required a Windows desktop system. Windows was required because the Blu-ray authoring software that was being used included a BD Live authoring component. The project gave me the chance to re-invent a Blu-ray authoring workstation from scratch so I thought what I’d do in this blog post and outline what we ended up doing here at Ryerson. One thing I had learned from both Apple’s Compressor and Studio 12 software was that the rendering process was the slowest part of the process, so a good processor is a key element. Since the research included some BD Live authoring (a relatively new programming discipline I guessed) I felt it was best to stay on Intel’s processors for this project so there would be no second guessing around the hardware as this new “black art” was being learned. In the end it was TigerDirect’s Bareboneasaurus promotion that caught my eye as the base technology for this project. We have people here on staff who love to build computers and when I spotted the 4 core Intel and 12 gigs of DDR 3 memory this had to be the Unit. Not only would the multicore processor decrease rendering time, but the amount of RAM associated with the Bareboneasaurus would be handy in the future for other development activities. The kit (in Tiger Direct speak) consisted of ASUS P6T Intel Socket LGA1366 Barebone Kit – Intel Core i7 920, 12GB Corsair DDR3-1333, 1TB SATA2, Clear Side ATX Mid-Tower, 650W. The price you see above is in Canadian dollars. For a video card –again in Tiger Direct speak– we chose a XFX GeForce 9800 GTX + Video Card – 512MB DDR3, PCI Express 2.0, SLI Ready, (Dual Link) Dual DVI, HDTV, VGA Support. For our first monitor we chose a Sceptre X23WG-1080p 23in Wide 8ms DVI LCD Monitor. Although its use would be primarily a VGA monitor, it’s 1080p capability meant it could also double as a 1080 display when checking HD Blu-ray material. We had an internal LG 6X Super-Multi Blu Ray Writer (Model : GGW-H20L) mounted in a startech.com 5.25in Silver eSATA USB 2.0 to SATA Optical Drive Enclosure. The portable unit had found a lot of use in the department writing one off Blu-ray media for display so I ordered a GGW-H20L specific for the workstation. It’s still not delivered, so they must be hard to come by and that’s why you see the external Blu-ray writer installed as part of the workstation below. To view Blu-ray media in 1080p and to act as a second production model we the second monitor a Sharp Aquos 32″ 1080p Flat-Panel LCD HDTV (model LC32D64U). We also chose a PlayStation 3 80GB as the Blu-ray player. The project needed an Internet connected Blu-ray player and we thought since SONY updates the software on its PlayStation’s we would be somewhat assured the hardware would work should BD Live firmware or software receive updates. Other additional items we obtained were four premium Blu-ray movie titles that BD Live content. One nice item we got with the PlayStation was the PlayStation Blu-ray remote control. After several botched attempts trying to access Blu-ray disks via the PlayStation 3 game controller the remote control actually streamlines access to the disc features. In a way its funny that Bluetooth was chosen for PlayStation 3 but unlike standard infrared remotes, it can be used without having to point directly at the PlayStation system. No Blu-ray blues with the hardware in this installation…..
Technology like Zacuto’s DSLR Baseplate Kits are making practical DSLR camera’s so they can be used in cinematography. Cameras like the Nikon D90 and the Canon 5D Mark II are impacting the industry so much, it’s to the point that the RED Digital is redesigning the Scarlet into a DSLR type camera. While most “full bodied” video and film camera types are watching with interest it appears a real revolution is going on in this space so one needs to take note. 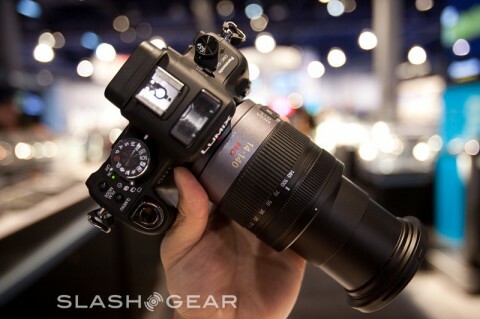 The pricing Panasonic’s new DMC-GH1 Micro 4/3 digital camera has just been revealed by SlashGear. The camera will go on sale in Japan on April 24th, priced at around 150,000 yen ($1,530). The camera will shoot 24 frame 1080P and is amongst a bevy of new hybrid DSLR cameras that are becoming available that take advantage ofD SLR lenses. According to an Engadget report SONY’s spinoff Field Emission Technologies is closing its doors. The company was youting the technology as a replacement for CRT monitors used in high end broadcast and film for critical evaluation. The technology had actually captured some buzz amongst the TV and Film engineering community. 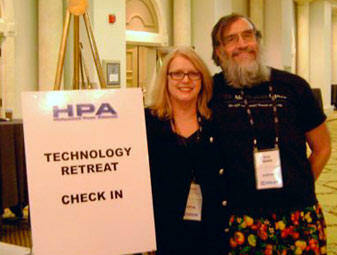 The Hollywood Post Alliance describes their 15th annual technology retreat with the slogan “Now more than ever! Arm your Brain”. Well if you don’t think te info “Arms your Brain” the minimum it can do is arm you for NAB 2009. While I can’t do a full report on this event since I wasn’t at the event, here are some one line highlights from various postings I have read. Panavison showed a new version of their solid state dockable recorder called the SSR-2. The SSR-2 records 42 minutes of uncompressed 4:4:4 or 84 minutes of uncompressed 4:2:2 HDSDI data. AboveNET’s high-seed fiber optic private network for motion picture, TV and media content creators. AboveNet offers high speed connectivity between studios involved in content creation and AboveNet owns the fibre. Alioscopy demonstrated a 3D display that required no glasses. Steve Weinstein noted that Hulu, YouTube and other over-the-top TV solutions are breaking cable and satellite. JVC’s GYHM 100 handheld and GYHM700 shoulder camcorders that natively record the file format used by Final Cut Pro. JVC showed two prototype 3D HDTV monitors both using polarized passive glasses. Mark Schubin noted most viewers watching HD are tuned to sports, with political content in second place, followed by awards shows and sitcoms. HD dramas did not make the list. MTI Film showed Control Dailies DA which ingests Red, Panasonic P2, Panavision Genesis and ARRI D21 material and is able to place this footage on the same timeline. Polled ATSC members on important features thought that an ATSC standardized advanced video codec and non-real-time services were top of the list, while stereoscopic 3D ranked 18th out of 26 features. Panasonic also showed a Varicam 3700 4:4:4 full 1080P resolution camera with master quality AVC-1 recording and external uncompressed recording. Sarnoff introduced a new Visualizer Digital Video Test Pattern that tests for compression, lipsync, color matrix mismatch, field dominance and chroma motion. EBU tests have found that MPEG-4 h.264 encoders have reached a 50% bandwidth savings vs. MPEG-2. SmartJog showed global electronic delivery of Digital Cinema Packets between distributors used for DCP mastering and servicing facilities. SONY’s 4K 3D projector can handle up to a 55-foot wide screen with 4.5 ftL of brightness. Snell & Wilcox introduced “Film Tools” conversion technology for the Alchemist HD Standard Converter. Pete Putnam noted that in recent months he has seen an increase in emails from consumers who are cutting the cable chord, saving money, and spending their days watching over-the-air television and videos downloaded via the Internet. Dr. Stephen Jolly BBC researcher noted that 120 Hz LCD TVs are becoming common and 180/200/240 Hz models are being exhibited. 300 Hz is may be the goal as its easy to convert to 50/60 Hz and is compatible with mains frequencies. It would finally unify our different TV standards. Sony Electronics showed an HKSR-5804 option for the SRW-5800 videotape recorder that turns the VTR into an uncompressed data recorder for 2K/4K DPX files. The ATSC and the Consumer Electronics Association are working to make TV receivers less prone to lip sync woes. Wanna be a NAB 2009 Reporter? 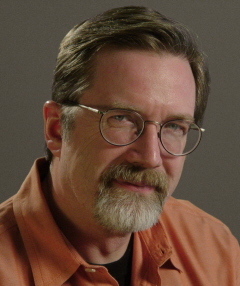 According to Final Cut Pro Guru Larry Jordan Digital Production BuZZ, which I believe is Larry’s podcast, has been selected as the Official Podcast of the 2009 NAB Show this year. That’s great news as Larry has been one who has put much into the Final Cut Pro community. However as these things go its being done on a minuscule budget and Larry is looking for a few reporters to help him out. Right now volunteer but if he gets enough sponsors he’s looking at remuneration. The podcast is sure to get a lot of play so this would be a good opportunity for someone who wants to raise their profile a bit or promote their podcast or blog within the community. “If you would like to be part of this effort, and are already planning to be at NAB, send an email to Debbie@larryjordan.biz. She will let you know what we need.